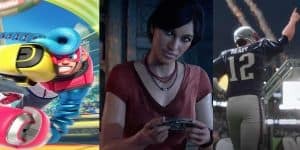 Best New Summer Video Games of 2017: Preview | Nerd Much? Summer has come upon us. And while most “normal” folk will be out basking in the summer sun, the rest of us do what do we best — video games. Nothing beats those cool summer nights gaming with the window open. Every year around this time, the full list of known upcoming games for the rest of the year gets filled out, and with E3 2017 right around the corner, it’s likely we’ll soon be adding many games to our fall release schedule. But the summer is almost officially here, and there are a metric ton of new games releasing before the big holiday rush release season begins. The saga of the Mishima clan is supposedly coming to an end with this latest installment in the Tekken series. Tekken 7 producer, Katsuhiro Harada, has promised a much darker story in this fighting game iteration. We’ll finally be getting some real answers regarding the origins of the Devil Gene that has plagued Heihachi, Kazuya and Jin. On top of the aforementioned story elements, Tekken 7 is boasting a couple of gameplay evolutions as well. The game features a Rage Art system now that enables players to dole out heavy duty damage when your health levels are critical. Secondly, the Power Crush feature enables fighters to fight through opposing attacks. Meaning, you can still inflict damage while damage is being inflicted upon you. Nintendo’s big summer release schedule begins with ARMS, which releases in two weeks. 2017 has already been a banner year for the fighting games genre, with new entries like Injustice 2, TEKKEN 7, and soon, Marvel vs. Capcom: Infinite. Nintendo will throw their name into the ring with ARMS, their first major fighting game on the Nintendo Switch. Of course, it wouldn’t be a Nintendo fighting game if it weren’t unique, and ARMS is certainly unique. Players will control one of a variety of unique fighters, each outfitted with extendable arms. Each character has a different set of abilities and unique glove options, adding an interesting level of strategy to the fighting game’s formula. If the test punch beta is anything to go by, Nintendo has their next big IP already in their pocket. Crash is back, and he’s looking better than ever. The groundswell of people clamoring for Sony and Activision to revive the character finally got their way. And at the end of the month, Naughty Dog’s early PlayStation darling comes back thanks to Vicarious Visions. The Crash Bandicoot N. Sane Trilogy features Crash Bandicoot, Crash Bandicoot 2: Cortex Strikes Back, and Crash Bandicoot: Warped – all in one package. The mechanics of the original trilogy remain relatively unchanged. However, the audio has been remastered and visuals now feature 4K resolution. The original two game’s cumbersome save systems are now out the window, and now employ Warped‘s ability to utilize checkpoints and save systems at will. Nintendo’s third-person shooter darling is back for round 2. Originally thought to be part of the “Deluxe” team of remakes for the Switch, Splatoon 2 is instead a full-fledged sequel with a new Hero Mode campaign and other modes in tow. The story revolves around the Squid Sister’s once again, the missing Great Zapfish and the evil Octarians. Hopefully it’s as solid and fun as the first go around. Splatoon 2 also implements new standard, sub and special weapons to its ink dispersing arsenal – including the ability to duel-wield pistols which allow dodge rolls and jetpacking mechanics. The sequel also includes the new “Salmon Run”, which is Nintendo’s take on the now classic Gears of War Horde mode. And much like was done with the original Splatoon, Nintendo has free updates planned for many months after launch. When Nintendo promised to further support the Nintendo 3DS after the Switch’s successful launch, they weren’t lying. No, this isn’t the evolution of the Hey You, Pikachu! style of gameplay, but it isn’t classic Pikmin either. Hey! Pikmin uses the touchscreen gameplay of its predecessor, but that’s where the similarities end. Hey! Pikmin is more akin to a 2D side-scrolling adventure than the open world real-time strategy of the core series. You’re still managing Pikmin and finding secrets with their different abilities. However, it seems this outing is keeping things safe and targeting a younger audience for the most part. It’s still a Nintendo published franchise, so the quality is sure to still be there. We’ll just have to wait and see if the depth of the series is still intact for us series veterans. Sega is apparently ready to take Sonic and his crew back to their roots. Sonic Mania (supposedly) represents a return to form for the blue blur and friends. Sonic, Tails and Knuckles represent your three playable characters and gamers head back to the 2D side scrolling Sonic style of old. Much like the initial trilogy, Sonic Mania breaks the game’s levels into Acts. At the end of each Act you’ll find one of Dr. Eggman’s bosses ready and waiting. There are new stages designed for the game as well as “remixed” classic levels from the original trilogy. The rings health system returns, as do the iconic TV styled power up boxes. Mania also features the return of hidden giant rings that lead players to special stages à la Sonic the Hedgehog 3. It’ll be exciting for sure if Sega’s development teams can actual pull this one off. Originally planned as DLC for Uncharted 4, Uncharted: The Lost Legacy was too good according to Naughty Dog to be a mere add on. While the game will still be free of charge to those who bought the Uncharted 4 season pass, Sony will also distribute the game as its own retail entity. Albeit at a slightly reduced price of $39.99. 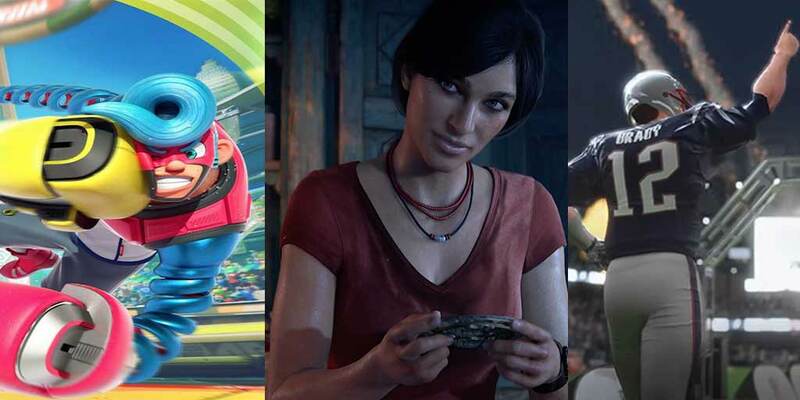 Should we be excited for The Lost Legacy though? Really, the question is – why wouldn’t we be? Naughty Dog has proven to be one of the most elite developers in the world. Just because Nathan Drake retired doesn’t mean that his puppet masters have. The game is sure to contain all of the epic set pieces the series is renowned for. And who knows, this could be the beginning of a whole new side series. This is a big year for the Madden franchise. For the first time, EA has built the year installment upon their signature Frostbite engine. Some pessimists suggest this could mean a step back as far as features go. But just a few days ago EA announced that fan favorite 3 versus 3 online co-op play would be making a return to the series. So why would they be stripping some features yet adding that? When it was revealed, EA said that this would be “Madden like you’ve never seen it.” They doubled down by promising that “Frostbite delivers a significant visual leap not only to the players, but crowds, stadiums and more.” And that Madden 18 will represent “the spectacle of NFL gameday come to life in our most photo-realistic game to date.” It’s impossible to know now whether all of this hype will amount to a fully realized product. But hey, EA is doing a great job of making us hope so. Expect a huge info dump at E3 2017 next week. Do we really have to write a couple of paragraphs to iterate to you why the world should be excited for this one? If you know shooters, then you know Bungie’s pedigree. They and Activision may have come out of the gates slow with the original Destiny, but by the release of their final expansion, Rise of Iron, the game and community were full speed ahead. We should expect that they’ll be hitting the ground running with the September release of Destiny 2. Destiny 2 takes place a year after Rise of the Iron. The Red Legion, lead by their leader Dominus Ghaul, have forced humanity out of The Last City. Thus, players are forced out into the universe to explore new worlds in effort of obtaining new powers to stop The Red Legion. And we couldn’t be more excited to see what Bungie has dreamed up for us. DC characters may be getting all the glory right now with the delight that is Injustice 2. But in just a few short months we’ll be going toe to toe once again in the world of Marvel. This time around, with Marvel v. Capcom: Infinite, the Infinity Stones are in play. Which is fitting seeing as how the next Avengers film will do the same next year. Yes, the Marvel Cinematic Universe’s presence is obvious in the character roster. Gone are the X-Men and Fantastic Four. After all, Fox owns the movie rights to those franchises. There’s no Wolverine, Doctor Doom, or anyone else from those series to be named as of yet. But rumors point to the inclusion of most of the key players in Marvel’s movie slate. Politics, folks. As far as gameplay goes, the core tag team fighting style remains intact. However, the new “free-form” tag systems adds even more versatility to the system. Tags can be essentially be done at any point now, whether mid-air or during chained attacks. You can also Counter-Switch now, enabling you to tag out while your partner is in the midst of being pummeled. And, of course, the Infinity Stones will have their own ways of mixing up each battlefield as well. We really don’t know much regarding new features for NBA 2K18 this year. Sure, it was announced that Kyrie Irving is our cover athlete. And that Shaquille O’Neal will adorn the Legend Edition. But that’s about it. 2K Sports hasn’t quite jumped into the PR cycle for the title yet – and they don’t need to. We’re excited for NBA 2K18 because we have no reason not to be. Year after year, Visual Concepts builds upon a consistently great NBA sim. In sports, numbers don’t lie. So when I tell you that 2K17 has a Metascore of 90, 2K16 has a Metascore of 87, and 2K15 an 87 too, you better believe that NBA 2K18 will nail that long range jumper once again. We’re just anxious to know what other tools they’ve implemented into their game.